First let me be clear. I am talking here about my old friend the Plausible Midfuture. I'm not going to answer for AD 40,000, let alone 40 million. And this is obviously not about Romance, for which the rule of cool is sufficient, even if it dresses in Plausible Midfuture outfits as a rhetorical flourish. But really, guys 'n' gals, we are not going to be colonizing space any time soon. (Well, probably not.) Not in this century, not in the next, perhaps not in this millennium. The whole idea is rocketpunk in the sense of Late Steampunk, the imagined projection of a brief era into a vast and timeless tapestry, i.e. Romance, which is different from real life. That being the point after all. But in merely practical terms, the Solar System is a whole lot of Oakland, still no there there. Think about the debate over whether it is better to colonize planets (moons, asteroids, etc.) or to build space habitats, so people can actually live in the middle of nowhere. This is no way to sell real estate. And let's be honest. If it weren't so cool, none of us would be talking about extracting exotic minerals from uninhabitable hyper-deserts, lacking even breathable air, located millions of kilometers away. People in the relevant industries are not talking about it. They are talking about, and investing in, technologies such as nanomaterials that either use less of those exotic materials or permit use of cheaper stuff instead. He3 from Uranus is an impressive line haul, but a tenfold reduction in the cost of solar cells makes plain old earthbound, tree huggy solar power cheap and abundant. (Under cautious assumptions, roughly 1 TW of peak production per 10,000 square km of collector surface.) Space-based alternatives postulate at least a tenfold reduction in launch costs, and still need relatively cheap cells to be competitive. Deep space alternatives pretty much require a hundredfold reduction in launch costs. That is a lot to ask of a mature technology, and basic space technology is fairly mature - we have been building and launching space missions on a routine basis for decades. A launch cost reduction of 100 x (to about $100,000/ton, or $100/kg) might in fact just be doable. Our current launch systems are geared to a low traffic rate, at most a few hundred tons put into orbit each year. A traffic revolution allowing economies of scale might cut costs tenfold, and decades of subsequent streamlining based on operational experience cut another factor of ten. But even that does not really provide a reason to do it, other than that it would be really, really cool. On the other hand, there is a place in human affairs (and the economy), for really, really cool: just ask Hollywood. And it is basically sheer coolness that accounts for the ISS and interplanetary missions, vicarious space tourism for everyone courtesy of NASA, the ESA, and a handful of counterparts around the world. If you are libertarian you can be philosophically grumpy about this, but it has gotten us this far, and there's no sign that private money-making ventures could have done anything like as well. The one thing in space (besides coolness) that we know is of value is knowledge - itself a form of coolness, among other things. And it will probably keep us going, even if it points at a future of research stations rather than mining colonies. Support of these research stations may in time give reason to mine stuff in space for use in space, but even if commercial mining firms develop they will surely be largely automated, and incidental rather than central to the long term enterprise of space. Beyond the midfuture this might point to a Solar System where some research stations evolve into towns, then cities, but situated at points of research interest rather than mother lodes of McGuffinite. And there is nothing wrong with that, even for purposes of Romance. Related Posts: Recently on space as the Wild West, and my first post on this general theme early last year. The image comes, as so often, from the ever-useful pages of Atomic Rockets. And here is another one implying that perhaps it isn't about real estate at all. 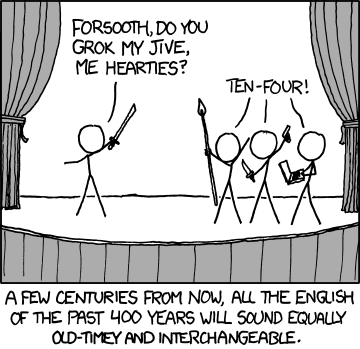 From a recent XKCD, via Language Log, comes this concise observation on the future history of the English language. (Don't forget to go to XKCD and do the mouse-over.) Over a somewhat longer time scale - but just how long is very hard to say - the spoken English of the future will become unintelligible, with the written language following at (perhaps) a slightly slower pace. There's at least one online speculation about 'Murrican in the year 3000, though the website is currently down. Given how widely it is spoken, I can readily imagine future English dividing into an 'Anglic' family of languages, as Latin fissured into the Romance languages. I seem to recall Arthur C. Clarke arguing that none of this would happen, because sound recording would freeze the language. He was wrong; apparently even the BBC no longer uses 'classical' BBC English. The rate at which this might happen is not known. There have been suggestions that language change, like genetic drift, is random in detail but happens at statistically predictable rates. But the known rates of language change vary widely. English has changed beyond intelligibility in the last thousand years*; Islandic Icelandic [oops!] has changed only slightly, and I've read that classical Greek is about as accessible to modern Greeks as Chaucer is to us. * Written English artificially exaggerates this, because Old English had very different spelling rules, but the spoken language would still be unintelligible. The biggest change wasn't all those French words the Normans brought, but the near disappearance of the Germanic grammatical case system - probably already fading from the spoken language before 1066. In any case we can only speculate about future English; we cannot predict it. For story purposes, however, we might want to evoke it. Inventing new slang words is an ever popular trick, though it is more common (and more interesting) for familiar words to acquire new meanings, as 'text' has now become a verb. Over longer time periods the rhythm of speech changes, which ultimately brings changes in grammar. 'Yoda I am' is a familiar example, long since beaten to death. Firefly used a mix of invented curse words and some subtle shifts of speech rhythm to effectively convey a different era. I once played around with using a pseudo 18th century diction to represent 'Standard English,' used in the 28th century as medieval people used Latin; a character trying to come on to communicate with a girl in a foreign station describes a trade starship as an Indiaman. Over longer time periods recognizable features would disappear, and a future language can only be represented by tone. The challenge then is a familiar one, equivalent to people in a fantasy novel speaking an invented language, or Marcus Didius Falco speaking a slangy, streetwise Latin. Related Post: My last look at language speculated about communication with aliens. Discussion on a recent post turned, not for the first time, to the economic implications of continued technological progress, especially technologies such as replicators. More generally, could a higher techlevel lead to a 'post-scarcity' economy? First, a benchmark figure. In rough, round numbers the per capita GDP in the US is about 10 times greater than it was 200 years ago, at the dawn of the industrial revolution. The early US was already a rich country - all that cheap land, stolen from the Indians, but industrialization has made us, on average, some 10 times richer. If that same rate continues into the midfuture, the economic level of 200 years from now should be about 10 times higher still, a per capita GDP equivalent to about $250,000 or $500,000. There are obvious constraints and provisos. Natural resource prices, in real terms, trended downward through the 20th century, but the low-hanging fruit has arguably already been picked. Oil, at least, will not get cheaper in the long term, and post fossil fuel energy probably won't be cheaper at the plug than energy is today. Automobiles have become more efficient and safer in the last 50 years, and may soon be 'smart,' but not cheaper or faster - so their basic functionality is largely unchanged. People regard old cars as classics; no one thinks of old computers that way. For that matter, the economic level of most 'Murricans has not increased much since the 1970s; the real GDP increase since that time has been funneled largely to economic elites. One popular dystopian future is a high techlevel, largely automated capitalism with practically no demand for labor, relegating most of the population to a marginal netherworld. This is a distinctly modern dystopia. There are hints of it in Heinlein, especially Starman Jones, but it is very different from the capitalist dystopias of a century ago - in Wells' The Time Machine the Morlocks were workers; it was the upper class Eloi who were the useless unemployed. But let's consider the possibilities of a high-techlevel economy. The classical economics view is that human desires are unlimited. We want things, like tickets to Mars, that we can't get now at any price. We quickly learn to want things, like mobile Internet access, that we previously never even thought about. On the other hand, our physical needs and comforts are in some sense biologically fixed. Dietary preferences vary culturally, but we can only eat so much. In much of the world, and certainly in industrialized countries, having plenty to eat is no longer a sign of wealth. As one consequence, putting on extravagant public feasts, like Bilbo's birthday party in Lord of the Rings, has pretty much died out as a custom. Even fancy society wedding banquets don't feature dozens of exotic dishes, or for that matter scores of liveried servants to bring them in. Oversized houses are still a mark of wealth, because big houses remain beyond most people's reach - hence the proliferation of McMansions in the US and probably other industrialized countries. But even this is probably in relative decline; McMansions are the mark of the pretentious demi-rich. The super-rich do not make their houses an object of display - in fact, their estates tend to be secluded. I doubt that an Elizabethan noble would be impressed by Bill Gates' house, and he'd be puzzled by its obscurity. 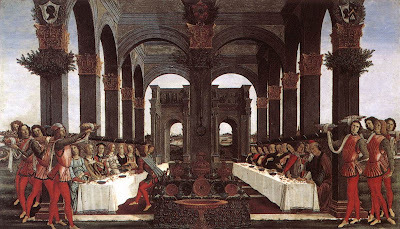 Feasts and palaces are things people prized not for their 'creature comforts' (an appropriate phrase), but for the status and power they embodied. Once they cease to be effective as display the demand for them reaches its limit or even trails off. I'd suggest that a similar law of diminishing returns may apply to material goods in general, once the economic level is such to render them unimpressive. On the other hand, the desire to impress does seem unlimited, because it is purely social and relative. 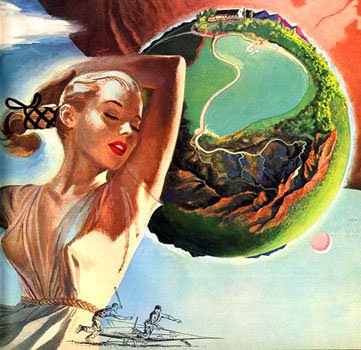 If the Joneses own a planet, you want to own one as well, or even a whole planetary system. Throughout the agrarian age - the age of feasts and palaces - material wealth was a great way to impress people. Or more than impress: If you could afford hundreds of liveried servants you could also afford hundreds of troops. But in a high-techlevel age, where mere display of material goods is no longer impressive, could people find other ways to impress? And what might those ways be? One way is simply by becoming well known. This is not new. It is what the Latin world nobilis, root of our 'noble,' originally meant. Indeed, before there were chieftains or aristocracies there were 'big men,' who made themselves the center of attention - and did things like putting on feasts in order to remain the center of attention. The modern rise of celebrity culture, people 'famous for being famous' might be a harbinger of things to come, hinting at the dynamics of a post-scarcity and post-capitalist economy. In such a world, capital resources might still be amassed, but only as one of multiple paths to eminence and status, and not the primary one. How we would get there, or what it would lead to, I don't know, but I will throw it out for discussion. Related link: For those who haven't come across links yet, here is the Tough Guide to the Known Galaxy on my old website. 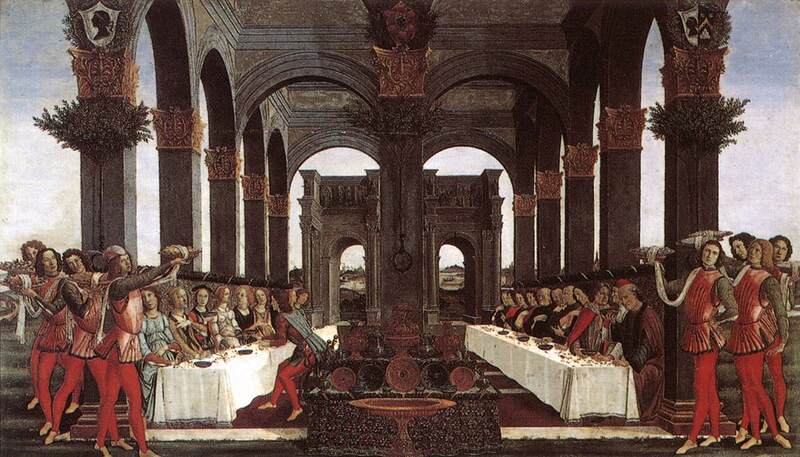 This painting by Botticelli, based on an episode in the Decameron, shows a Renaissance wedding feast. The subgenre of Romance that I call Space SF is often not really about space, or only partly about space. This point is raised again by a blog post last week by SF writer Charles Stross. [Link fixed!] Go read it, and report back for commentary and discussion. Stross beats up on libertarianism, so I don't have to, but his core point is not political (though it does have political implications). Our vision of our space future is, first and foremost, about new worlds, inspired of course by the original New World, new at least to the Europeans who stumbled upon it 500 years ago. This is why Firefly worked so well, even though its only nod to space realism was one silent rifle shot. It had the tropes we cherish most - the space tramp steamer, the rugged frontier worlds, the whore with a heart of gold. It even had its old fashioned hostile injuns, the Reivers, safely removed from any claim to human sympathy, the perfect anti-Na'vi. Joss Whedon stripped Space SF (or at any rate 'Murrican Space SF) down to its most basic essentials, released our inner Bat Durston, and made it fly gloriously, if alas briefly. The best option is natural shirtsleeves planets. For these you need interstellar travel, and even then they may be hard to come by. My own guess is that most 'Earthlike' planets, by astronomical standards - lifebearing worlds with liquid surface water - will be uninhabitable by humans, at least without major terraforming. Earth itself was not human habitable for most of its history. In space itself, as Stross says, there is precious little room for those rugged-individualist frontier tropes. Space is just not that sort of environment, short of truly heroic tech assumptions. And there is little place in space itself for classical style colonization. Once it is technically and economically possible at all, some people will live in space simply because they want to live in space. But far more will go into space without intending to settle there, and given time some will end up living there permanently. 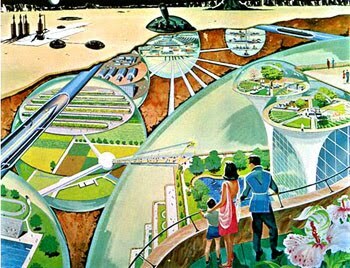 True space colonization, if it happens, is likely to be accidental, as transport nexus stations draw in enough secondary- and tertiary-sector activity that they evolve into towns and ultimately cities. And the tropes that belong to them will be urban tropes - perhaps, for example, hardboiled detective fiction - rather than the classical frontier tropes. Related Posts: There are a bunch, but for now I'll link to two posts on Transport Nexi, and A Solar System For This Century. 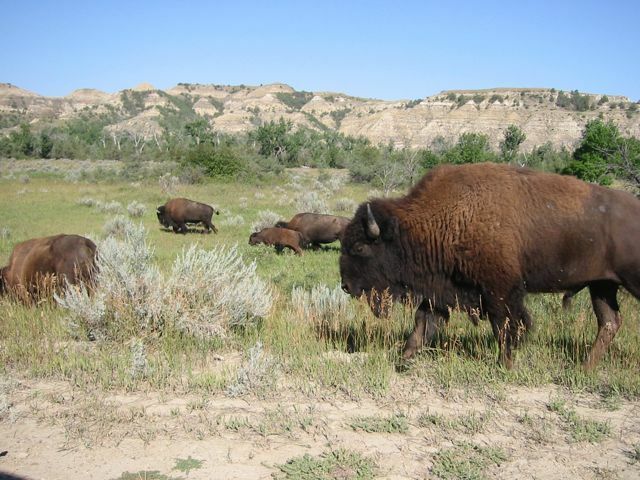 This buffalo-rich image is of Theodore Roosevelt National Park in North Dakota. The bomb that fell on Hiroshima 65 years ago today tomorrow was by no means the most destructive event of the Second World War. Nor was the one that fell on Nagasaki three days later. 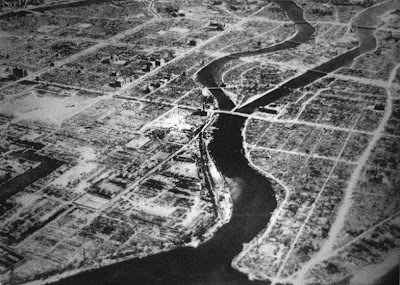 What set the atomic bombs apart was the dreadful cheapness of the devastation they wrought, one plane doing the work of a thousand-plane raid. Mutually Assured Destruction does seem like a reasonable projection if current trends persist, but most people want to read about superpowers clashing at full power - or at least about a superpower using its full power to oppress canny rebels - which is incompatible with a MAD scenario. Which is sort of a downer ending, and also makes it very hard to come up with a sequel. The image of the Hiroshima aim point comes from The Asia-Pacific Journal: Japan Focus. Related Post: "I am become Death, destroyer of worlds"
Thus the image of the Spanish landing on Terciera in the Azores in 1583, showing the advanced state of amphibious doctrine at that time. Though the remainder of this discussion considers mainly 'blue water' action, in deep space at a higher techlevel. And here is an arbitrary but always appropriate link to Atomic Rockets. Suppose an expeditionary force is approaching from deep space. For our purpose it makes no matter whether the attackers are in transfer orbit from Mars, Europa, the rings of Saturn, or from a wormhole. The defenders may choose to defend from low orbit, or even from the surface. I argued in the first of this series, Space Warfare I: The Gravity Well, that the disadvantage of 'low ground' may be countered, or more than countered, by the advantage of concealment ranging from submarines to missile-launching trucks. In particular, surface launched kinetics are convenient and deadly against ships in low orbit. For the wider defense of local space, kinetics launched from low orbit can take advantage of an efficient Oberth effect boot to kick them into the teeth of an incoming attacker. A defense based on the ground, or orbital forces, can also dispense with costly deep space ships with their specialized propulsion and long duration life support. Ground troops need only plain old barracks, while orbital forces can obtain provisions and support from the civil orbital infrastructure. On the other hand, a close in defense means fighting amid that same orbital infrastructure, implicitly leaving it vulnerable to the attacker. Urban warfare is hard and costly for an attacker, but it is also pretty damn hard and costly for the city. There is good reason to fight the wolf at the threshold and not by the hearth. Fighting at the threshold instead of the hearth may make the battle less interesting, because if we are fighting away from the clutter we don't need to worry about hitting civilians, can pretty well distinguish good guys from bad guys, and therefore can give free play to automated systems firing at Stupendous Range. 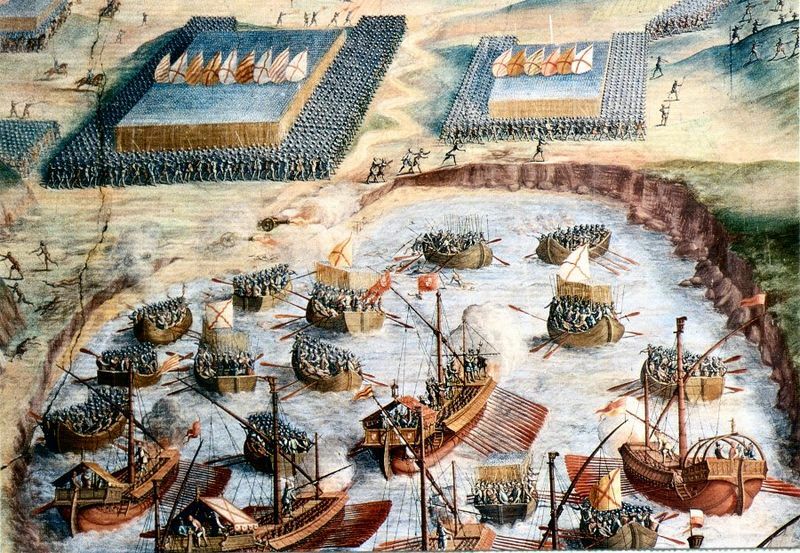 This battle is likely to be boring, but shame on us for complaining. These people aren't fighting for our entertainment - well, on a meta level they are, but to them it is sheer bloody murder. (Even if the battle is robotic, fortunes in hardware are being thrown away.) The battle is also likely to be Lanchesterian, which is of more consequence. What constitutes the threshold and not the hearth will be determined first and foremost by weapon ranges, as the range of smoothbores set the traditional three-mile limit. Even under the modest, midfuture assumptions I typically use, these ranges qualify as Stupendous Range. Consider a 1 gigawatt UV laser, zapping at 100 nanometers through a 10 meter main mirror - a main armament worthy of a laser star, but nothing magical. It can concentrate its beam onto a 1 meter spot at 40,000 km range, and burn its way through Super Carbon Nano Stuff armor at about 1 centimeter per second, a meter in less than two minutes of steady zapping. At 400,000 km - lunar distance - our battle star can burn through a millimeter in less than 15 seconds (spot size 10 meters), scorching surfaces and destroying any sensitive surface equipment, such as sensors. Kinetics, if launched at more than escape velocity, have nominally unlimited range. Their practical range is determined by flight time and target performance. If the target can veer farther in the time before intercept than the kinetic's deflect motors can reach, then it is home free. Otherwise it is at risk of a hit and must engage the kinetic with point defenses. Kinetic target seekers, we will assume, have chemfuel deflect motors, with high acceleration but limited delta v, perhaps 3 km/s. (This is distinct from the initial boot that sends the bus toward the target.) If the target is a deep space ship with a high ISP drive, its acceleration is limited to the milligee range. At 3.5 milligees the target can put on 3 km/s in about 87,500 seconds, just over a day. So if flight time is more than a day the ship can 'outrun' the target seekers. Less than a day, and it will have to engage them. And at a closing rate of 10 km/s the target seekers' intercept envelope extends to 875,000 km - twice lunar distance. These are nominal figures, and highly sensitive to input assumptions, but they give us a sense of the scale of things. Given no ambiguities about who the players are, a range of 100,000 km is knife fighting distance in space. Relatively unsophisticated kinetics can reach out and touch you at distances approaching a million kilometers, and plausible midfuture lasers can scorch you at a similar distance. You can defend a zone this large from low orbit, but your orbital infrastructure is vulnerable to an attacker at a similar distance. Thus the frontier zone, on order of a million km, within which your close-in defenses are effective, but beyond which you must mount any forward defense. For the attacker it is the same picture, viewed from the other side. Within the defender's frontier zone you are exposed to direct attack by home defenses; beyond it you can only be engaged by 'forward' defense forces. And for some acts of war - notably deep space blockade - you as attacker need never enter the defender's frontier zone. You need only engage departing ships after they leave the defended zone, or arriving ships before they enter it. Which could involve some interesting deep space chases, especially if the requirement is to board targets, not simply blast them. A deep space blockade is in some ways easier to sustain than a traditional sea blockade. No storms will drive you off station, and while on station you consume only stationkeeping propellant. The blockade constellation might be headed by a base station, a jumbo tender with most of the support functions, kept well back, and supporting half a dozen 'cruiser' laser stars fitted to carry boarding crews, gunships, etc. In response to this threat, a defender who does not wish to pay for a full deep space force might build 'monitor' laser stars, not configured for true deep space missions but with sufficient delta v to force a blockader to engage or fall back onto an escape abort orbit that lifts the blockade. Related posts: Here's the Space Warfare series, plus some closely related ones. Note that my views are also a moving target - the form of killer bus I proposed in Part VII turned out to be hugely inefficient given even present-day guidance technology.